The average consumer values their digital content at £3,241. That's according to research done by WD® and for parents sharing priceless pics of our little ones with friends and family our personal mobile content library – and the value we place on it – is only likely to increase as our children grow up. What we all need, of course, is more storage. And thats's where the WD® My Passport Ultra comes in. Not only does it pack a 1TB punch in terms of capacity, but it can help when it comes to freeing up valuable mobile memory - and with (according to the research) 7% of us running out of storage daily, 16% reaching ‘full memory’ at least weekly and 1 in 3 (31%) run out of storage capacity at least monthly, that's help a lot of us could use. And it's at hand, because you can win one of these stylish and practical storage solutions by entering the Rafflecopter giveaway below. There are a number of options to choose - or you can increase your chances by choosing them all. The only stipulation is that you enter before midnight on Saturday 27th February and that you're based in the UK. 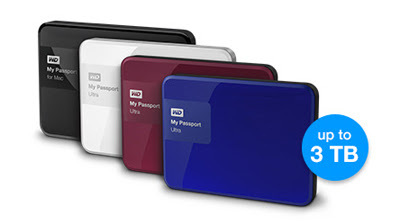 Draw is for one WD® My Passport Ultra Premium Storage backup drive, capacity 1TB, no alternatives given, prize donated by WD®/Edelmann PR, no responsibility accepted for any loss or damage resulting from use of the device and no correspondence will be entered into.